There are bacteria and viruses in the bloodstream, too! 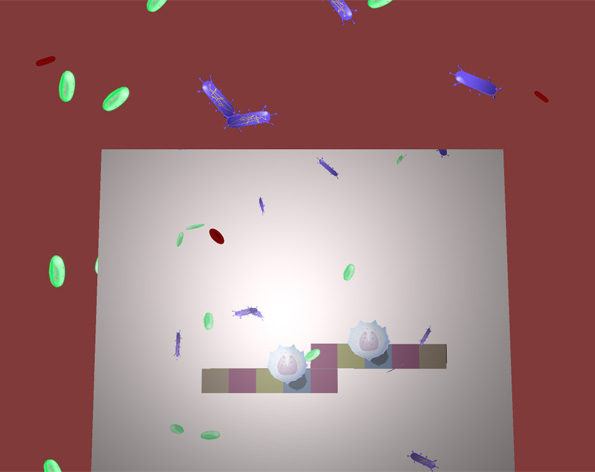 Coordinate together to assemble a defensive wall of white blood cells and fight back with antibody projectiles! Download the Bacterial Invaders Proto.zip file. Extract the contents and run the simulator.exe file to provide a simulation of the ScreenPlay input mechanism. Run the BacterialInvaders.exe file for prototype. Click on the coloured tiles in the simulator to interact with the game.